I was on a panel recently where I enumerated some reasons why I think it is a mistake to mass incarcerate drug-addicted criminal offenders. The chair of the panel cracked “You forgot to mention that they use even more drugs behind bars than they do on the street!”. The other guests and members of the audience nodded knowingly. Insert Al Gore-esque sigh here. I have written before about how many people who have never been in a prison are confident that they know what prisons are like. This is one example: the “common knowledge” that drugs are just as available inside the stony lonesome as they are outside. I deflate this myth with research evidence in my piece today at Washington Post’s Wonkblog. INL’s Shawshank Redemption: thanks to cannabis legalization in WA and CO, the US now finds “flexibility” in the drug control treaties. Historically, the United States was the chief architect of the prohibition-oriented international drug control regime, and among the most “hawkish” of the signatories (along with Sweden, France, Russia, Japan, and Singapore, and much of the Arab world). The U.S. did a bunch of finger-wagging at the Dutch for their relatively liberal policies. And the Bureau of International Narcotics and Law Enforcement in the State Department (“INL” in Alphabet-speak, informally “Drugs and Thugs”) has long been one of the more hawkish players in internal drug-policy debates. The treaties, on their face, require the criminalization of not only drug dealing but drug use. One of the arguments made against the tax-and-regulation approaches adopted by initiative in Colorado and Washington State was that their adoption would put the country out of compliance with its treaty obligations. There are legal loopholes: the treaties acknowledge that their obligations apply to each signatory only insofar as consistent with its domestic institutional arrangements. Since the U.S. federal government, the party bound by the treaties, lacks the constitutional power to require criminalization at the state level, it’s not clear that the actions by Colorado and Washington State voters can be said to have been illegal under international law. Uruguay has gone further, legalizing at the national level. The Uruguayan government argues that even that is allowed by the treaties, because the treaties recite the reduction of illegal drug trafficking and the protection of public health among their stated goals, and the Uruguayan law is designed to accomplish those goals. Whatever the merits of that argument legally – personally, I don’t think it passes the giggle test, though as a policy matter I’m glad Uruguay is making the experiment and hope it succeeds – it is one that the United States could once have been counted on to scorn. And yet, when the U.N. Commission on Narcotic drugs met in Vienna last month, and some member countries got up to criticize the Uruguayan move (which the International Narcotics Control Board, the referee set up by the treaties, promptly denounced) the U.S. had no comment on that issue. In part that reflects changing U.S. public opinion about cannabis, and the more liberal stance of the Obama Administration compared to its predecessors. But in part it reflects the fact that INCB also blasted Colorado and Washington State, putting INL in the position of having to defend the permissibility under international law of those regimes and of the accommodating stance toward them adopted by the Justice Department. So the voters in those two states in effect forced a change in our national stance in international fora. Here’s Ambassador William Brownfield, the Assistant Secretary of State in charge of INL, explaining the new stance: the treaties, we are now told, are “living documents,” allowing “flexibility” in how different nations choose to meet their obligations, and we should seek a new consensus about what that means. Obvious, once it’s happened. (It might not have happened in, say, the Romney Administration.) But, as far as I know, not predicted in advance by anyone, least of all by me. Footnote It would be easier to take more seriously the self-appointed “Global Commission on Drug Policy” if spokespeople such as Michel Kazaktchine didn’t insist on making nonsensical claims, such as that minor drug offenses account for half of U.S. incarceration (the actual figure is more like 20% for all drug offenses) and that prohibition has failed to reduce consumption (compared to what?) and that alcohol and tobacco control via taxation and regulation have been more successful (by what measure). Reihan Salam is a great interviewer, even when he’s stuck with me as a subject. Your mileage may vary, but this seems to me like a very sensible conversation, at least on Reihan’s side. A good interviewer is hard to find. That isn’t the end of the good news. The more than 100 million Americans who receive coverage under large-group plans are also getting better coverage due to the Mental Health Parity and Addiction Equity Act. Passed in the waning days of the G.W. Bush Administration with the regulations being written by the Obama Administration, the law mandates that any offered benefits for addiction and mental health must be comparable to those offered for other conditions. But wait there’s more: Medicare, which enrolls almost 50 million people, has long had inferior coverage for addiction and mental health outpatient care, reimbursing only 50% of costs versus 80% of those for other forms of medical care. Thanks to a provision in the 2008 Medicare Improvements for Patients and Providers Act (again, give it up for the 110th Congress and President Bush), this disparity in reimbursement is being phased out and will be entirely eliminated by January 1 of next year. 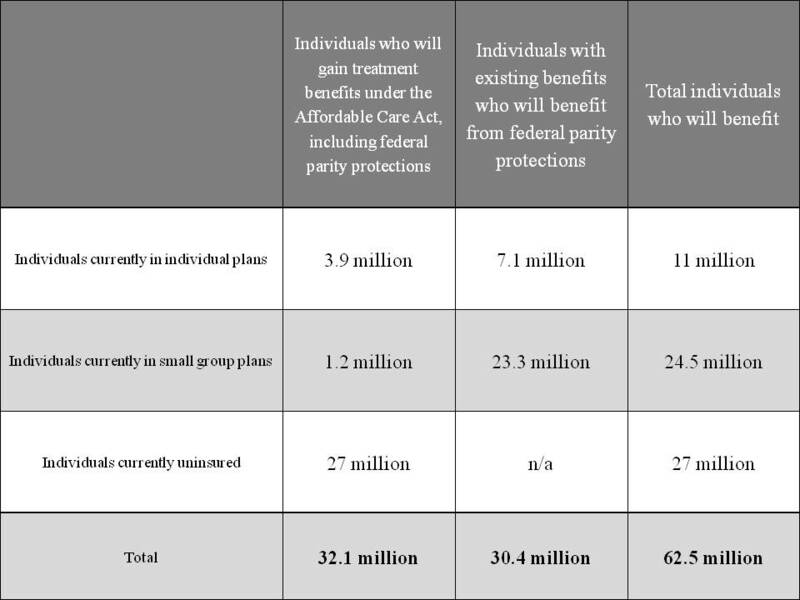 When you consider that addictions almost always evidence themselves in adolescence or early adulthood, it becomes clear that the ACA provision allowing parents to keep children on their insurance until age 26 adds yet another layer of protection for the population. Some people of course have coverage from more than one of the above sources, but even granting that overlap, over 200 million Americans have gotten improved insurance coverage for treatment of drug and alcohol problems (and mental health disorders as well). This includes many people who were starting with nothing, as well as a large population that had a benefit of inferior quality. This is the biggest expansion to access to care for addiction in at least 40 years and probably in American history. In financial terms, it is certainly the biggest commitment of public and private resources to the health care of people with substance use disorders in U.S. History. Congratulations are in order to countless grassroots advocates, civil servants, political appointees, members of Congress and two U.S. President for transforming the face of health care for addiction. Our friends at Washington Monthly have provided a vivid example of a piquant feature of drug legalization debates. As a group, the editors and writers at Washington Monthly have been broadly supportive of the proposition that we should regulate marijuana like alcohol. Yet the current issue carries Tim Heffernan’s expose on the monopolistic, addiction-generating, profit-grubbing ways of…you guessed it, the alcohol industry. I am not picking on our WashMo friends as some sort of bizarre exception to the rule, they are very much in the left-wing mainstream: Strongly convinced that marijuana should be regulated like alcohol, while simultaneously being completely distrustful of the very industry they are holding up as a model (this is even moreso the case when the comparision is made to the legal tobacco industry). Meanwhile on the political right, a parallel role reversal occurs. Most conservatives want to punch those dirty hippees who are trying to push back government control and make way for a private sector business because, damn it, that’s, that’s…wait a minute, that’s what WE always say is a good idea! Those damn hippees stole our playbook! What is going on? Why do liberals who are normally skeptical of corporate power and aware of the limits of government regulation become wide-eyed innocents when singing the virtues of a legal marijuana industry? Why do government-hating pro-business conservatives suddenly want the government to stamp out all the private sector marijuana entrepreneurs? Way too many aspects of U.S. politics are explained as being a “legacy of the 1960s and 1970s”. But…this is a legacy of the 1960s and 1970s. The cultural coding of marijuana as a thing that liberals like and conservatives hate is so strong that each group tends to ignore all its other beliefs on this issue and adopt the other’s traditional stance. I am not a baby boomer, so the odds are I will never get this at a gut level because I wasn’t “there”. But it still fascinates me as a sociopolitical phenomenon. It is very difficult for elected officials to talk seriously about drug policy reform (It is easy for them to talk about it non-seriously, but that’s a separate matter). The issues require nuanced dialogue, but the debate is dominated by polarized shouting matches. Reform minded politicians are typically reduced to un-sound-bite-worthy statements such as “I’d like to reduce the number of people in prisons but I am against the legalization of drugs so don’t accuse me of that” or “I think we need to be tougher on violent drug markets but I mean violent dealers not drug using teenagers so please don’t accuse me of being a heartless drug warrior”. It’s a lot of work and political risk to fight for a cause that most voters aren’t too thrilled to hear about in the first place. I recently had the honor of being asked to join an advisory council to the New Jersey Governor’s Council on Alcoholism and Drug Abuse. The main reason I agreed is that Chris Christie is one of the few governors in the U.S. who is elevating drug policy reform discussion in a way that both does justice to the complexity of the issues and acknowledges the need for change. Here are two 60 second snippets; the reaction to the second is particularly noteworthy. Given that I am in London and sitting in the very chair you see pictured here, it is only natural that I make this weekendâ€™s film recommendation the movie in which it appears: Matthew Vaughnâ€™s stylish and brutal â€œLayer Cakeâ€. Thatâ€™s obviously not me pictured, but the magnificent Sir Michael Gambon. He plays wily drug kingpin Eddie Temple in one of the great British gangster films (which is saying something, they have been making outstanding movies about guns and geezers over here for three quarters of a century). The film centers on cocaine middleman “Mr. X”, played convincingly by a pre-James Bond Daniel Craig. One of the many things the film gets right about the illegal drug trade is that it includes people like Mr. X who think they can make big money while remaining untouched by the damage that drugs do downstream and the violence and immorality of the kingpins who call the shots upstream. Mr. X tells himself he is just a businessman whose commodity happens to be illegal, and that he will simply leave the drug trade behind him when he is financially secure. But when drug honcho Jimmy Price (Kenneth Cranham) gives him an unusual assignment, his assumptions are shattered and he quickly gets in way, way over his head. Meanwhile, he develops a serious case of the hots for a low-level gangster wannabe’s girlfriend (played by Siena Miller…rumor has it that she and Craig prepared for their scenes together Lee Strasberg-style). The supporting cast is uniformly strong, especially Colm Meaney as a long-time gangster. There are some over-the-top camera shots by Vaughn which some people found self-conscious and annoying, but they work well given the kinetic story line. 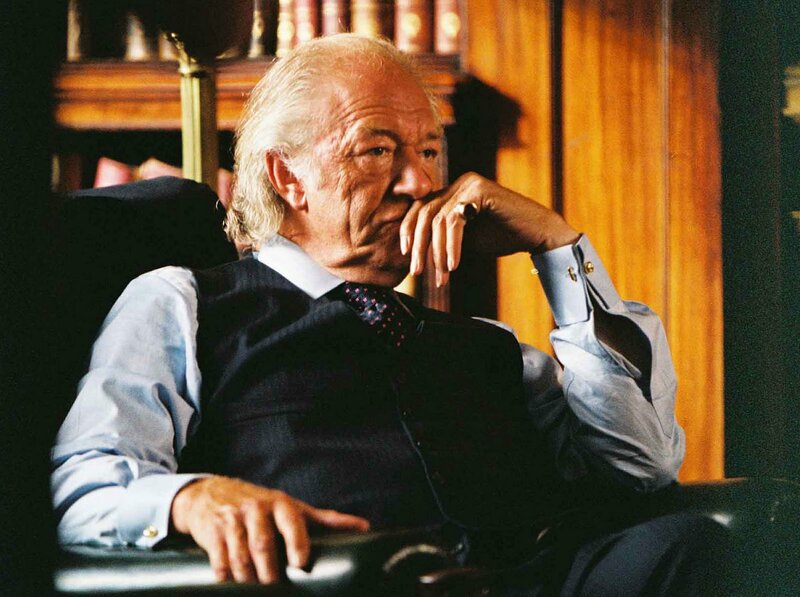 And Gambon’s soliloquy on “the facts of life” is as quotable and as well-delivered as anyone could ask. p.s. This film is rated R with an exclamation point, so by all means donâ€™t bring the kids. p.p.s. Vaughn shot three different endings for this movie, all of which I’ve watched and he definitely picked the right one. Drug policy research is at best a modestly sized field. Nonetheless, its findings have significant potential to help societies develop more effective public policies regarding marijuana, heroin, cocaine, nicotine and other psychoactive drugs. I am therefore very glad to announce that an extension of the international drug policy research integration conducted for the book Drug Policy and the Public Good appears today in The Lancet. A generation ago, a reviewer of the world’s drug policy research findings would have been pressed to fill even one article in such a prestigious scientific outlet; the field has clearly matured since. *Louisa Degenhardt and Wayne Hall integrate the international evidence on the contribution of illicit drug use and addiction to the global burden of disease. *John Strang, Tom Babor, Benedikt Fischer, David Foxcroft, Jonathan Caulkins and I discuss “what works” in drug policy, reviewing the evidence on source country control, interdiction, policing, prevention and health and social services for drug addicted individuals. Lancet has made the articles available with a free registration here. A shorter take on some of the key conclusions in the third paper is also available for free in an op-ed by Jon Caulkins and me in The Guardian (UK) today. I have spent too much time in public policy circles to be starry-eyed about the likelihood that scientific evidence will be always be heeded in a policy area that is often dominated by demagogues of various stripes. Yet I also see many positive signs in Europe and the U.S. of openness to information in quarters that had previously been a mix of loud voices and closed ears. Scientists cannot and should not control drug policy (that would be grossly undemocratic), but they certainly can contribute systematic and reliable findings to the policy debate and insist that serious research be given more weight than wishes, hunches and anecdotes. The reviews of the drug policy research knowledge base in The Lancet today are offered to policymakers and the public in that spirit. Please consider this an open thread to debate and discuss anything in The Lancet papers if you are so led. Starting tomorrow, Stanford’s Center for International Security and Cooperation will host a two-day conference on violence, drugs and governance in Mexico. In preparing for the event (at which Mark Kleiman will also be in attendance), I decided to try to estimate the current revenue streams of the Mexican organized crime organizations (MOCOs). I leaned heavily on RAND research and on the analyses of colleagues in Mexico to generate my estimates, so credit for whatever is correct in these charts goes to them whereas any errors are solely on my own head. The most difficult thing about getting current revenue streams correct is estimating how much the MOCOs are making from non-drug-related activities (e.g., smuggling immigrants across the border, pirating videos, kidnapping, extortion). Everyone I read or talked to agrees that this line of MOCO revenue is growing, but estimates of how large it is were divergent. The first chart here uses the low-end estimate among experts of 15% non-drug revenue. If this estimate is correct, the MOCOs are still largely one dimensional drug trafficking organizations, with principal profit coming for cocaine. 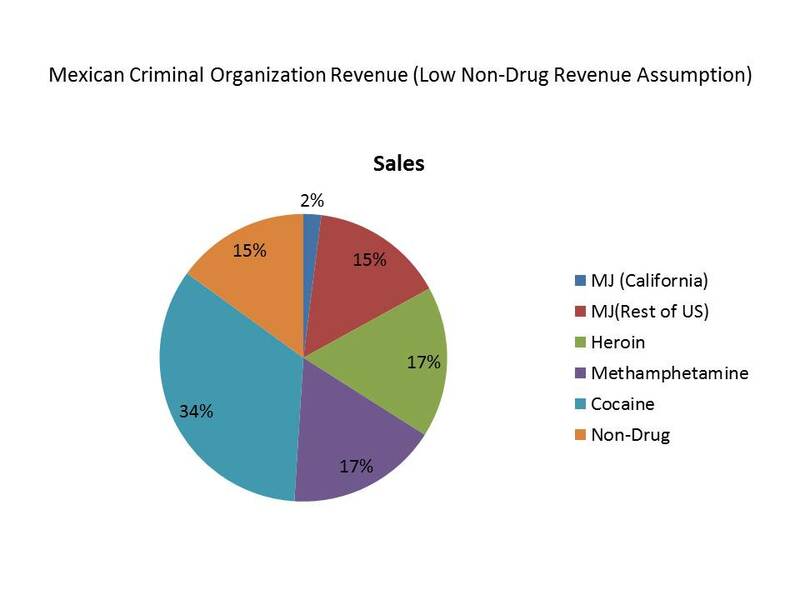 Note that were we mapping drug markets more generally, cocaine would be a much larger share of the pie but because much of that money is made by Colombian gangs, the share for the MOCOs is smaller.